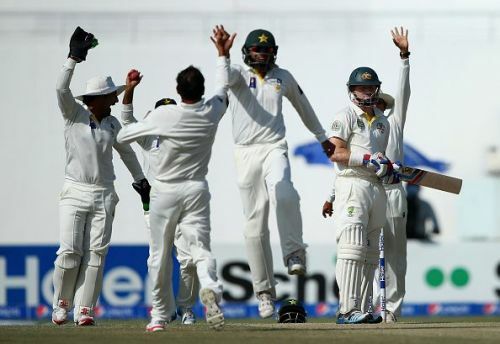 Before Australia embarked on the tour of the UAE in 2014 to play Test matches against Pakistan, they were on a high with the No. 1 tag to their name. But a ruthless hiding from a formidable opposition brought their world crashing down. This time around the scenario is different which suggests that perhaps results will be different as well. Yes, after the retirement of two stalwarts – Misbah and Younis, Pakistan's batting looks a bit brittle on paper. Not to mention Sri Lanka beat Pakistan 2-0 in the last Test series played in their adopted home. Younis Khan played a huge role in the series whitewash against Australia in 2014. He scored 468 runs and made three 100s in four innings. Azhar Ali also contributed with 292 in the series. In the bowling department, Zulfiqar Babar with 14 wickets and Yasir Shah with 12 scalps ruled the roost. An SOS sent for Hafeez at the eleventh hour shows that there are jitters at the same time realization in the Pakistan camp that the team is short on experience. Hafeez can provide stability in the middle order and his off-spin will be more than useful in the UAE. Azhar Ali and Asad Shafiq will have to bat for a long period of time so others could build the innings with them. Wahab Riaz is making yet another comeback, but perhaps this could prove to be his last Test series if he fails to live up to expectations. In 2014, David Warner was the one who fought gallantly against the spin of Zulfiqar Babar and Yasir Shah, and scored 239 runs in the two-match Test series. Steve Smith wasn’t far behind with a total of 174 runs in the series. Interestingly, both these payers are serving bans; therefore, the Australian team will be hoping to see some of ‘young guns’ to rise to the occasion. Let’s have a look at the relatively new Aussie batting line-up. It is nothing short of an unknown commodity; so much so that even name pronunciation of one of their players – Labuschagne has become quite a puzzler lately. Uncapped batsmen – Aaron Finch, Travis Head and Marnus Labuschagne are likely to make their Test debuts in Dubai. The Aussie opener Matt Renshaw will probably open the innings, depending upon his recovery from the head injury he incurred while fielding at short leg position in the opening match of the tour against Pakistan A. On the basis of excellent knocks played by Marsh brothers in that match the team management must be hoping for a better display by their batsmen in the forthcoming series, Mitchell scored 162 and Sean played a patient innings of 94; but one mustn’t forget that Pakistan A didn’t feature any frontline spinner. Perhaps the Pakistan Cricket Board gave Australia a taste of their own medicine. In 2016, on their tour to Australia, Pakistan team had to play against a bunch of under-19 cricketers in a practice match before the Test match. Australia will be depending heavily on the off-spinner Nathan Lyon. Though his performance in the last series played in the UAE was quite dismal, to say the least, he bowled the most overs, got 3 wickets for hefty 422 runs. But Lyon has come of age since then and could pose a tough challenge for the Pakistan batting line-up which can crumble against spin.